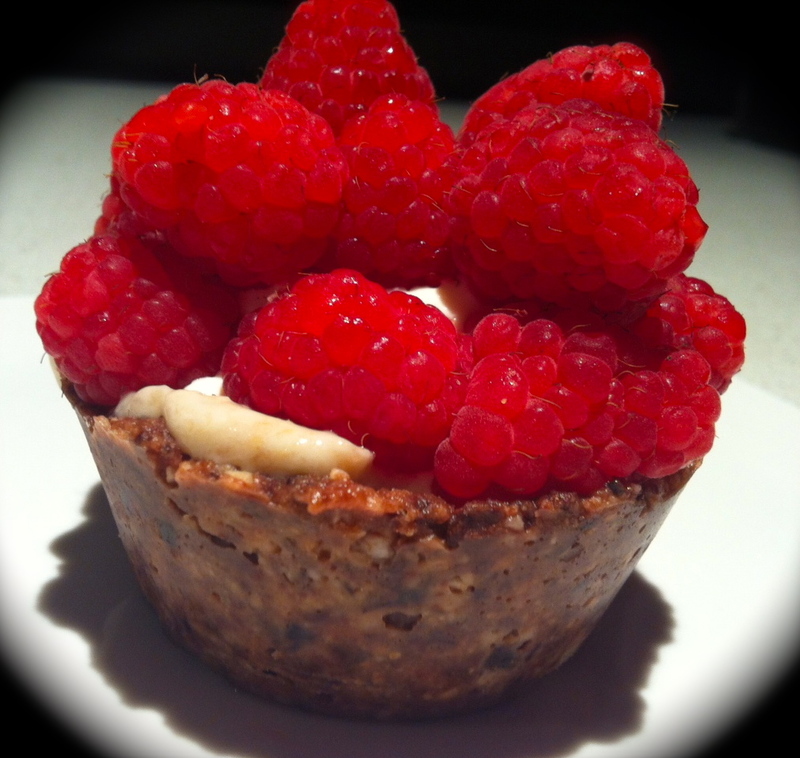 This little bite-sized dessert ticks all my boxes – fresh raspberries are always a luxurious indulgence, it’s got no added sugar and so I can convince myself it’s healthy. Actually, for a dessert, it is! It’s technically paleo (although I know desserts aren’t in the paleo spirit), it’s GF, grain free & raw (if that’s your thing). I made this for Valentine’s Day this year as it’s also I think a completely romantic treat. Whichever way you look at it, they are delicious. Try serving on a dessert platter with strawberries and chocolates. Mix it up: You can also make these in smaller or larger sizes and play around with the filling and toppings (if you’re not dairy/sugar free try lemon curd/ dollop cream/ caramel/ chocolate ganache or tiny scoops of icecream topped with blueberries/grated chocolate/sliced banana/toasted shredded coconut etc etc. Blend all ingredients (except chocolate) in a food processor or blender. Stir in the chocolate. Press into cupcake moulds (or mini cupcake moulds if you want bite sized ones). Refrigerate or freeze for a few hours or overnight. They will keep in the fridge/freezer. Blend the frozen banana in a food processor (I use my little whizzer on the handheld mixer) or blender. You may need a few drops of water to get it blending. If you use too much water to will end up too sloppy to be ‘ice-cream’. Scoop into the casing, top with raspberries and serve immediately. Alternatively you could scoop the banana into the casing and re-freeze for 10-15 mins to firm up, then top and serve. How did they go? I shared one for dessert tonight with ice cream & ice magic! Hope you enjoyed.